This section applies to monitors such as the Windows or Unix Performance Monitors. 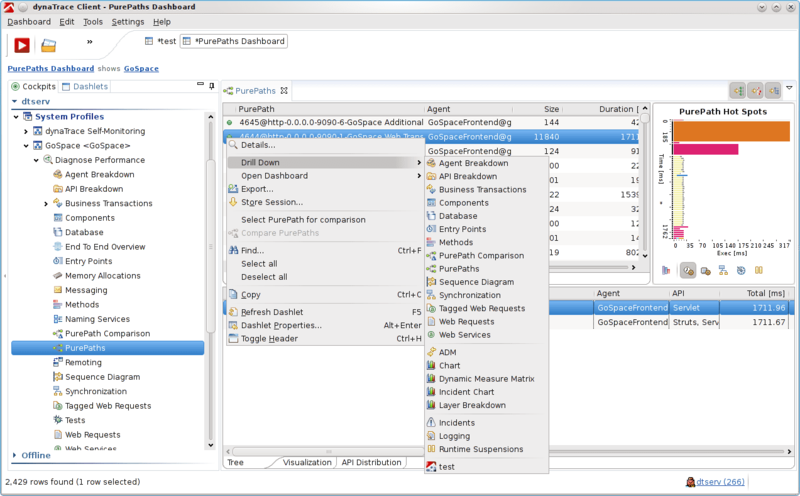 This includes Agents with built-in host monitoring capabilities. To monitor the CPU, memory, network and disk of each host, see Host and System Monitoring. Use multi-host monitoring to monitor many hosts, and define them all only once. As new hosts are automatically added, they are automatically monitored. Each monitor provides dynamic measures that you can see when you drill down to a specific dashboard. 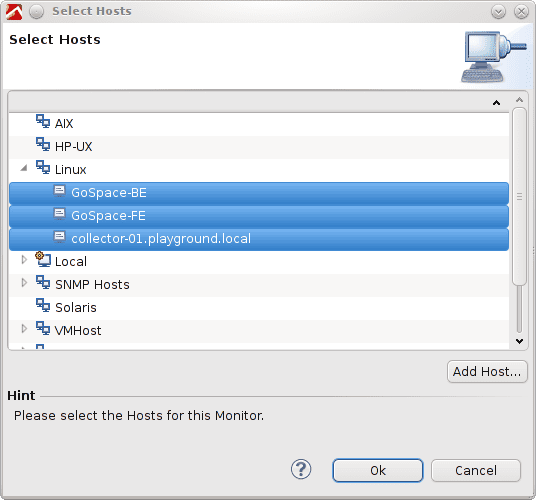 Each configured monitor needs a host as a parameter. For example, the Windows Performance Monitor must identify which machine it should monitor. Since it can monitor multiple hosts, you don&apos;t have to repeatedly configure a monitor. Configure it once in the predefined monitors when you set up system monitoring. Each monitor delivers data in dynamic measures, so you can manage the data and create charts easily. For example, if you use the Windows Performance Monitor to monitor the memory usage of five machines, you get one dynamic measure. Add this to a chart that contains one dynamic measure for each host you monitor. New hosts appear in the predefined monitor when an agent starts on a host. AppMon adds them automatically because they belong to a specific hostgroup. As you diagnose a transaction, observe the machine health. Drill down to a predefined dashboard that contains the host measures. AppMon shows you the relevant measures for the transaction you’re analyzing. 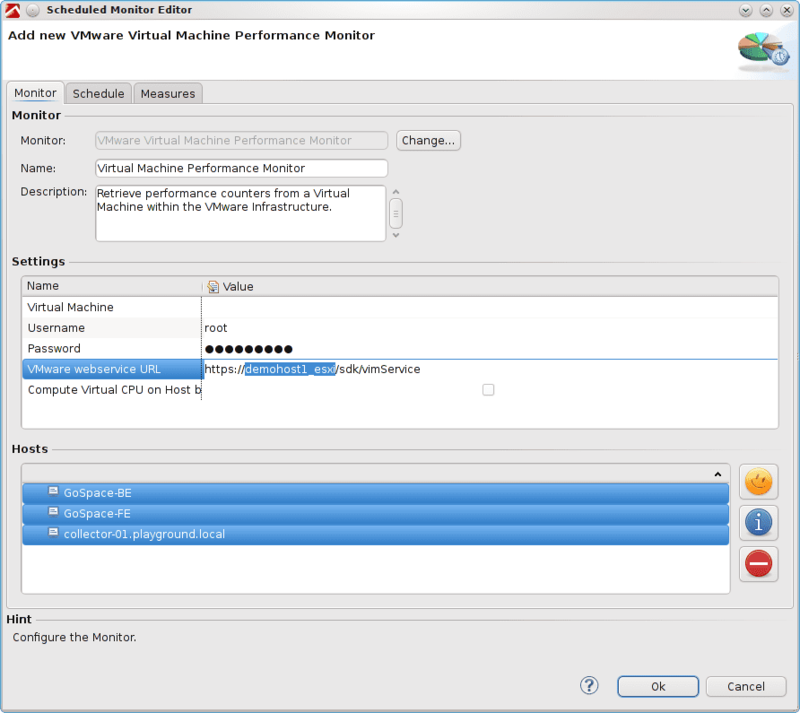 In this tutorial, use multi-hosting to set up a VM monitor that monitors multiple VMs. 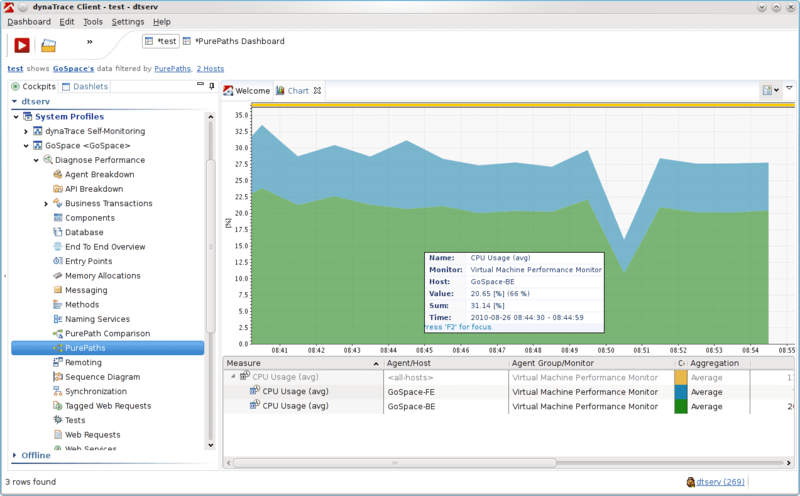 Then, chart the CPU usage of these VMs in a split chart, and save the dashboard. Finally, use the information to perform a drill-down. Alternately, go to Start Center > System Health and Host Health Monitoring and look at the predefined System Monitoring dashboards. The dashboards use the same functionality to monitor Windows and Unix machines. In this scenario, VMWare runs on a host that includes three VMs. Two of them host the easyTravel Demo Application. The third hosts a collector. 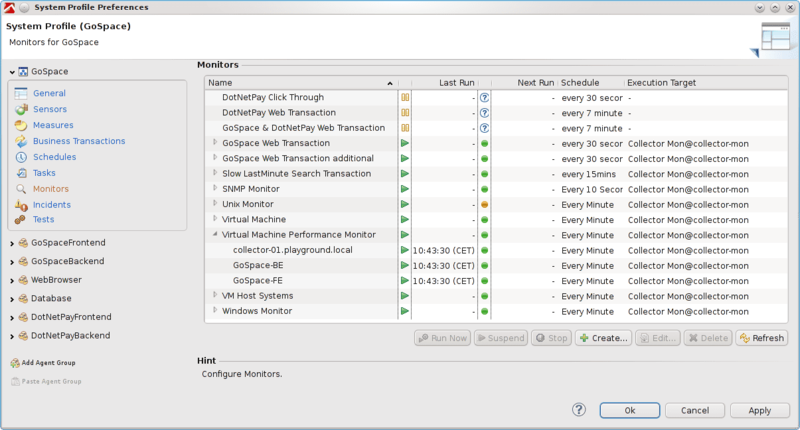 Set up the VM monitoring process and correlate the transactions with the VM Chart. 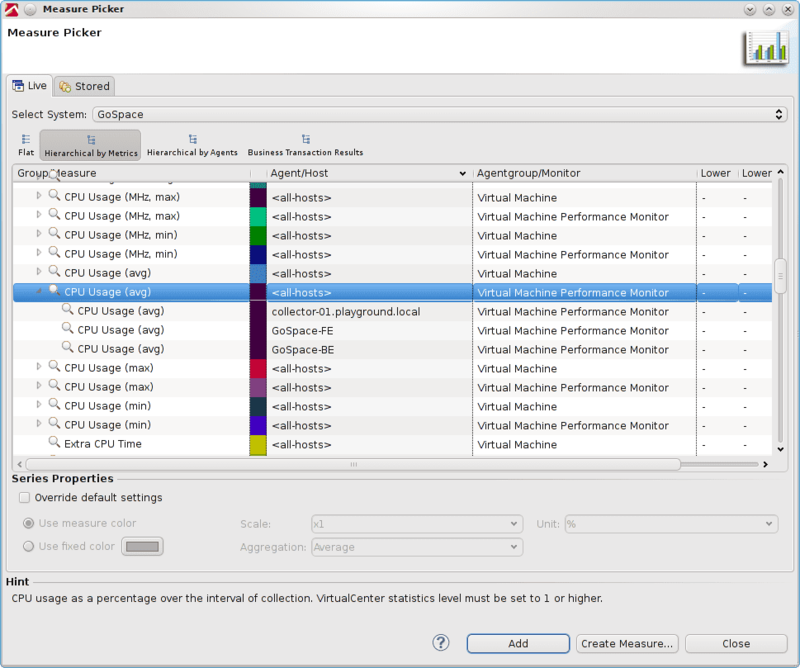 Open the System Profile Preferences dialog box and go the Monitor item to create a new VM monitor. Enter the name of your vHost into the service URL. Enter the appropriate user and password necessary to use the VMWare web service API. Select the correct host that represent your VMs and choose the default Every Minute schedule. To verify it works, click System Profile > Apply. Click Run Now on the new monitor. All your hosts should appear green. 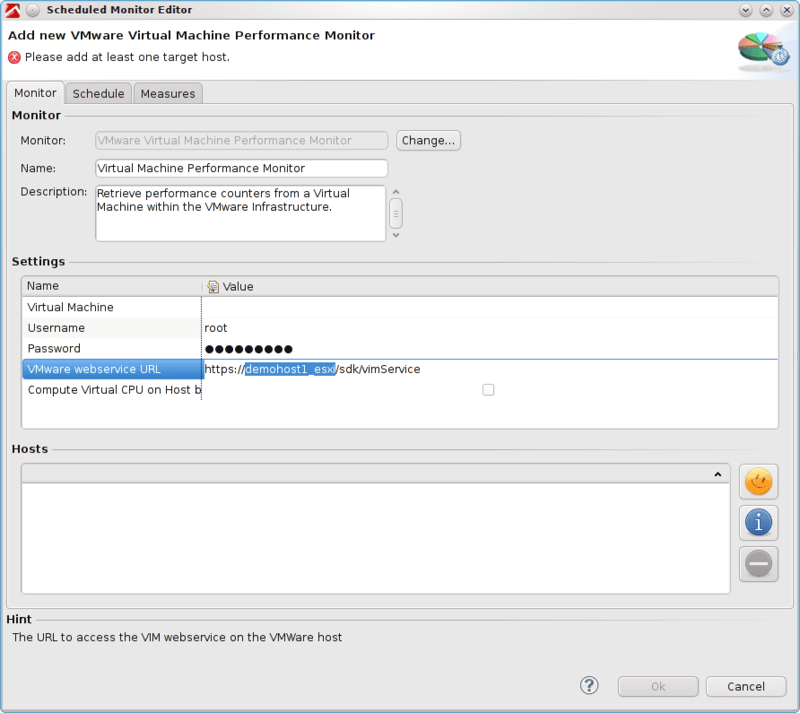 VMWare guest tools must be installed so the VMWare monitor can establish the connection between a host and a VM. After the monitor is set up successfully, add the measures to charts. 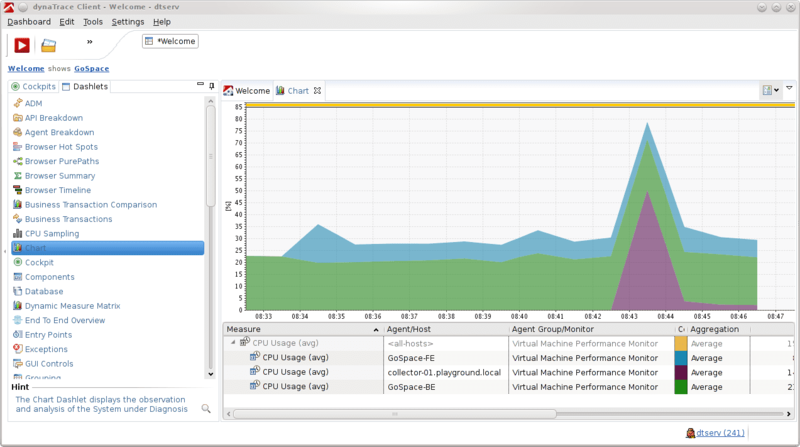 Add the CPU that the VM uses and change the chart to a stack area chart. You can see which VM consumes how much real CPU based on the host. When you look at the table under the chart, notice that all of the configured hosts are available as a dynamic measure. You can also define one incident on the dynamic measure and it applies to all incidents. If you set up a Unix or Windows Performance Monitor for the same host, you can chart the CPU as seen by a guest, side-by-side, in the VMs view. Store the dashboard for later use, but leave it open. Now, use this dashboard for diagnostics. Run the Last Minute Search on the sample application so you have some data. Open the PurePath and drill down to the new dashboard. The dashboard filters all hosts crossed by the PurePath. The same process works for all monitors. System Monitoring works the same with Windows and Unix-like hosts. Multi-host monitoring successfully monitors, charts, and produces alerts for a number of hosts. You can analyze diagnostics easily because the charts filter to crucial data.